Perhaps the best resolution for the new year is to cultivate a focus on the presence of God in our lives, to become aware of God's presence within ourselves and let the glory of God shine forth in our daily routine. 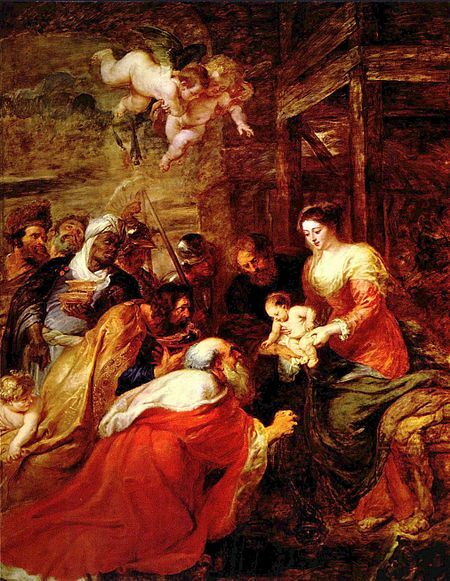 Today we celebrate the Epiphany: the manifestation or showing forth of the child Jesus as the messiah to the magi. We really don’t know who the biblical visitors were--wise men or astrologers or spice traders. All we know is that they were non-Jews who came from far, far away, guided by a mysterious bright star. They came to pay homage to this Jewish baby called Jesus. In today’s readings, the word of God from Isaiah takes us back to the sixth century before Jesus. The Jews were freed, to rebuild their city of Jerusalem. The author indicates a divine light will emanate from this shining city on a hill and all people, Jews as well as non-Jews, will acknowledge and walk by this light. Christians see Jesus as this light who illuminates darkness, who shows human beings the ultimate purpose of life: to be in relationship with God and thereby manifest the glory of God through who we are and what we do. St. Paul's letter to the Christian community at Ephesus in Turkey outlines our future. Jesus is indeed our guide: a beacon of hope for all. In the Gospel according to Matthew, we have all the ingredients of a great story: exotic visitors, a wicked king, court intrigue, a mysterious star, precious gifts, a new child. The magi give homage to this child with gifts of gold, frankincense and myrrh, highly symbolic gifts about the identity of this child. Gold can symbolize kingship or divinity, the things of God; and the coin of this child’s heavenly realm are the virtues of self-discipline, compassion, responsibility, friendship, courage, perseverance, honesty, decency, respect and faith in God. Are these virtues the “currency” of our own lives? Frankincense with its wonderful fragrance and medicinal magic can symbolize healing, and this child came to heal our wounds and bridge the chasm separating us from God and one another. We too are called to be healers. Myrrh or ointment can symbolize a burial embalmment, and this child through his dying/rising re-established our relationship with God. Now who is this child? This newborn messiah, completely human and completely divine, is the exemplar or prototype or model of what it means to be an authentic human being. That is why some ask themselves: what would Jesus do in this or that circumstance? With Jesus as our model, God invites us, from an infinite number of possibilities, to live a holy life, every man and every woman, without exception, regardless of age, race, socioeconomic background, career or calling in life. Holiness is allowing God to enter into the very fiber of our being so that we can become the best version of ourselves through who we are and everything we do. Now is the time for us to begin again, to become the best version of ourselves.